Samuel was the final Old Testament judge. Besides Deborah and an anonymous man in Judges 6:7-10, he is the first prophet mentioned after Moses, although we could consider some of the other judges among the prophets. He lived during the 11th century B.C. Samuel's mother Hannah was unable to have children and she prayed desperately before the tabernacle that the Lord would grant her to bear children to her husband Elkanah, an Ephraimite. 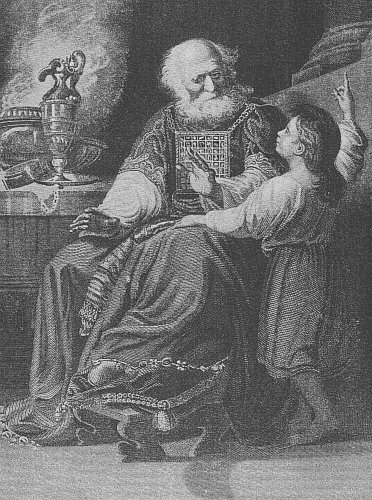 Because the Lord heard and answered, Hannah called her son "Samuel," which can be translated "heard by God." This account is in the first chapter of 1 Samuel. In response to God's love for them, Samuel's parents dedicated him to the Lord's service: "And when she had weaned him, she took him up with her, along with a three-year-old bull, an ephah of flour, and a skin of wine, and she brought him to the house of the Lord at Shiloh. And the child was young. Then they slaughtered the bull, and they brought the child to Eli [the priest in the Lord's house]. And she said, 'Oh, my lord! As you live, my lord, I am the woman who was standing here in your presence, praying to the Lord. For this child I prayed, and the Lord has granted me my petition that I made to him. Therefore I have lent him to the Lord. As long as he lives, he is lent to the Lord.' (1:24-28)" He entered sacred service and trained in the house of the Lord at Shiloh under Eli. God called Samuel to speak for Him in a series of night messages and established him as His prophet. One of Samuel's most difficult assignments came immediately after his call. Eli was allowing his sons to abuse their priestly offices and through the young man, the Lord condemned their behavior and pronounced God's judgment upon them (see chapter 3). Samuel's own life didn't always go smoothly. Just as Eli's sons had betrayed their sacred trust as priests, so also "Joel and ... Abijah ..." the sons of Samuel, became unrighteous judges who "took bribes and perverted justice. (8:1-3)" Perceiving this as a problem in God's leadership as well as that of Samuel, Israel demanded that they be given a king such as the surrounding nations had. Samuel warned them that this would lead to even more problems and woes, but when they kept insisting, the Lord told him to do as the people requested. 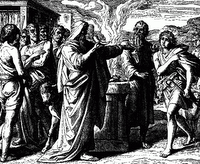 Samuel anointed Saul to be Israel's first king (10:1). Because of Saul's continuing, flagrant disregard for God's Word, Samuel repudiated Saul's leadership and traveled to the house of Jesse, where he anointed David to be king in place of Saul (16:13). Samuel's loyalty to God, his spiritual insight, and his ability to inspire others made him one of Israel's great leaders. When he died, "all Israel assembled and mourned for him, and they buried him in his house at Ramah. (25:1a)"
For more on this man of God, see an earlier post that focuses on a series of deceiving appearances in his life.